This week, Thanksgiving is upon us, and it also happens to be International Food Workers Week. It’s a time when we should be celebrating and giving thanks to all, but especially to those that work to provide the food we feast on during this holiday. This USDA pilot program “seems rigged to provide financial benefits to the producing companies while putting food safety at a lower priority” says one top lobbyist from a food safety advocacy group. He notes that in order to correct the problem, we must create new legislation to ensure food and worker safety is not ignored. Over 65,000 UFCW members work in the meatpacking industry, including the poultry sector. If the plans go through, our members are at risk of ailments that have been associated with increased line speeds, including musculoskeletal disorders like carpal tunnel syndrome. 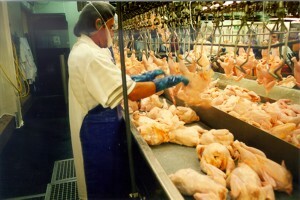 The UFCW is calling for further study on the worker safety elements of the USDA proposal before it goes forward. With a union, workers can stand together to fight for better working conditions at poultry plants. Workers like Esmundo Carranza don’t deserve to be treated like animals, simply because the company values profit over people. UFCW members are continuing to support legislation that will ensure safety first for the workers and protect consumers. Together, we can ensure food-workers are treated with the respect they deserve.